A perfect Lightweight Portable machine rotatable touch screen with Windows 10 updated and MS office licensed installed. WEIGHT STARTING AT 3.48 LB / 1.58 KG WEIGHT WILL VARY BY CONFIGURATION. In 2013, we reviewed the EliteBook Revolve 810 (Core i5-3437U, HD Graphics 4000). At the time, the device ran on an Ivy Bridge processor. Since then, HP has updated their EliteBook Revolve series. Now the line is equipped with Haswell processors. Do the devices profit from the new processors? Our review reveals the answer. Because the EliteBook is structurally identical to its Ivy Bridge predecessor, we will not cover the case, connectivity, input devices, display or speakers in this article. A comprehensive analysis of those facets of the device can be found in our review of the Ivy Bridge model. The EliteBook Revolve 810 G2 is a convertible from HP's high-grade business line. The devices are primarily designed for companies and/or professionals. The computers are outfitted with a docking connection and a TPM module, while a 3G modem is available for an additional fee. Our test device is currently on the market for around 1700 Euros (~$2285). The EliteBook is equipped with a Core i5-4300U processor (Haswell architecture). It has two cores and runs at a base speed of 1.9 GHz. Using turbo, the processor can kick up its speed to 2.6 GHz (two cores) or 2.9 GHz (only one core). The CPU has a TDP of 15 Watts. The processor's full performance is available in AC power mode; the device completed the Cinebench benchmark's single-thread test at 2.6 GHz and the multi-thread test at 2.5 GHz. In battery mode, the processor executed both tests at 1.9 GHz. The Haswell processor runs at the same base clock rate and the same maximum turbo speed as the Ivy Bridge CPU in the EliteBook's predecessor model. As a result, these two processors make an easy direct comparison. However, there is one small difference: If both CPU cores are in use, the Core i5-4300U processor's maximum clock rate is 2.6 GHz, while the Ivy Bridge processor worked at 2.7 GHz. Overall, the Core i5-4300U processor is supposed to deliver results that are about 5 to 10% better than the Core i5-3437U -- at the same speeds. A look at the results confirms this to us. All in all, the Core i5-4300U processor achieves good benchmark results. In normal use, throttling will not occur. The system runs solidly and fluidly -- which is no surprise, after all, the computer has a stronger processor and a quick Solid State Drive at its command. The results in the PCMark benchmarks also prove to be good to very good. A 128 GB Solid State Drive from Lite On serves as the system's mass storage device. The SSD consistently offers good transfer rates. Our test model's SSD clearly eclipses the Samsung SSD in the EliteBook's predecessor. Nevertheless, the Lite On SSD does not quite reach the level of top-model SSDs. Faster models are available. Our EliteBook houses an HD Graphics 4400 graphics core. It supports DirectX 11.1 and runs at speeds of between 200 and 1100 MHz. The results in the 3D Mark benchmarks are more or less what we expected. HP could have achieved better results had they equipped the computer with two memory modules. If they had, the working memory would have run in dual-channel mode and better maximized on the GPU's potential. Of course, dual-channel mode would also have improved the system's gaming performance. The EliteBook is not primarily intended for gaming. Since this is the case, it is unsurprising that only some computer games play fluidly at low resolution and low quality settings. As a general rule, games from the Windows store that are designed for the Windows 8.1 Metro interface run without a problem. The EliteBook goes about its work quietly, whether in idle mode or under full load. In idle mode the fan stands still, and under load it does not whir especially fast either. In terms of noise volume, the computer is clearly superior to its Ivy Bridge predecessor. However, the EliteBook's fan generates a faint whistling/chirping sound -- a flaw that should not be present in this price class. Our review device never grew excessively warm in our tests. During the stress test, we measured temperatures beyond 40 °C (104 °F) in three spots. In terms of heat generation too, the EliteBook does better than its Ivy Bridge predecessor. Under every level of load, the new HP device stays cooler. The computer completed the stress test (Prime95 and Furmark running simultaneously for at least an hour) in the same way in both AC power mode and battery mode. The CPU went about its work at 1-1.1 GHz. The graphics core ran at 100-750 MHz. 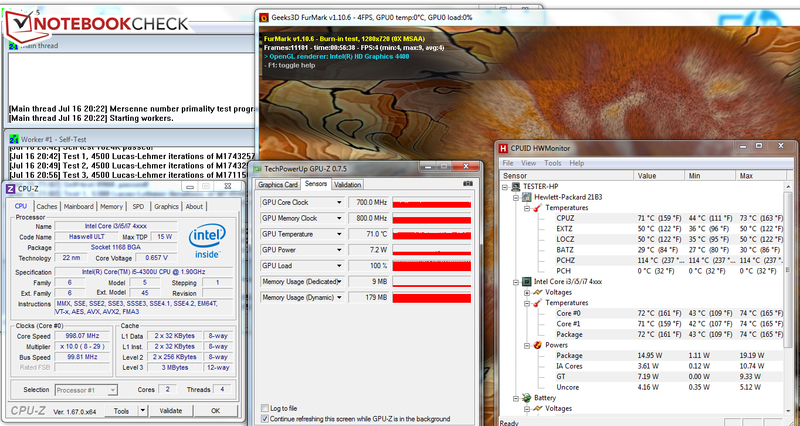 During the stress test, the CPU temperature leveled off at around 71 °C (159.8 °F). In idle mode, the EliteBook proves to be very frugal with its energy. This is what we have come to expect from devices with Haswell CPUs. Under load too, the computer's energy consumption rates lie in the expected range. Once again, the EliteBook beats its Ivy Bridge predecessor. Overall, the new device uses less energy.